this has been one of my projects for the past month or so. off of E-Bay. I have the copper but haven’t gotten around to it yet. Wow – those are sweet! Those are really nice! An exact project I’ve been wanting to do. Where did you buy the precut metal turning blanks? Very nice…...Each one is a treasure….GREAT job! I bought the pre-cut metal pieces off of E-Bay in lots of 4 or 6 with free shipping. I am sure other sources also have them such as Metals Online, Amazon, Etsy, etc. Note: DO NOT turn metal in a lathe chuck designed for wood. 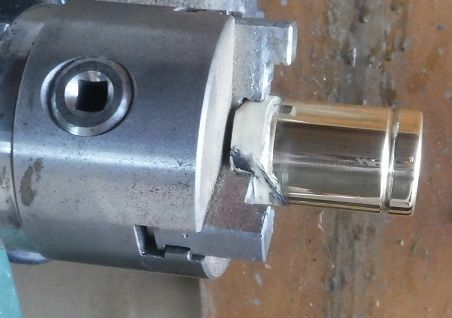 you MUST HAVE a lathe chuck specifically made to hold metal stock. your choice of which metal and size to use. a “Vixen File” is great for dressing soft metals. Very nice collection of mallets. Beautifully finished. Did you buy a metal chuck to mount on your wood lathe and just used files for shaping, accenting and finishing the metal? WCP – yes, exactly like that. 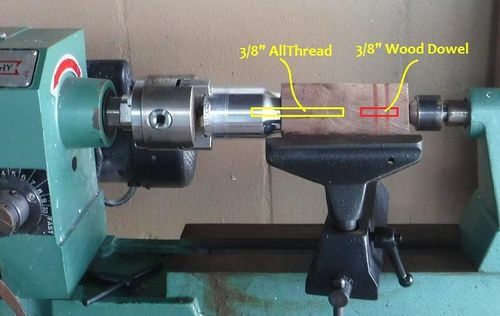 the metal chuck has a 1”-8 thread that fits my harbor freight wood lathe perfectly. I also used some common HF steel turning tools and carbide cutters. then wet sanding from 320-600-1500 grit then to the polishing compounds. adding different colors of wood in the handle is a nice touch. Sweet mallets John, very well done. I particularly like the stainless ones. 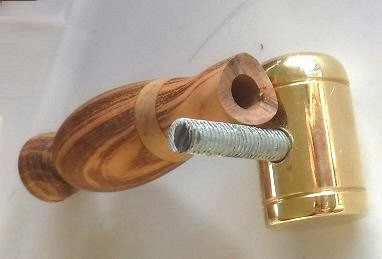 In the last picture, do you epoxy the threaded rod into the handle? Thanks for the reply and clarification. 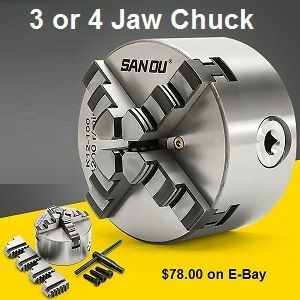 I am now searching for a 3 jaw metal chuck for lathe. I say again how beautiful your mallets are. Lew – yes, the 3/8” threaded rod is epoxied into the handle about 3”. so now I make it a point to ensure the all-thread rod goes past the ring for security. if the inlay is on the bottom of the handle, I epoxy a 3/8” wood dowel in that section for security. the handle for the final turning works best for the best alignment and balance. after turning the head, I put a fixed drill chuck in the tail stock and mill a 5/16” hole dead center for the rod. aligned perfectly back in the chuck and tail stock for final turning. if the handle is mounted on the side of the head, they both must be turned separately then attached. some turners like to drill a 1/2” hole in the head and glue the handle in but I don’t trust that method. the metal head mallets are not used for aggressive carving, it is for the delicate tap-tap-tap method. These are very nice shop made tools. in order to retain the grain structure. (draw a magic marker line down one side prior to cutting). as they think it is just too darned pretty to use….. well, these are working tools – they are meant to be USED !!! with aluminum, you have the mass without the weight. with brass and copper, you have the weight without the mass. with stainless steel, you have the weight and strength for aggressive stone carving without the mass. Congrats on making the Daily Top 3. Vvery Nice John! Well done and Congrats on the Top 3! They look great , just wonder why so many?